Origin: Asia, Europe (Atlantic and Mediterranean coastal region). Habitat: it supports saline environments. It is found in the seaside, notably on walkways and walks (for example, in Biarritz, where they are very old and sometimes sick but resistant). 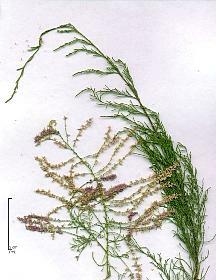 The Tamarisk searches sunny positions and prefers well-drained soil and not limestone. Hardiness: zone 7 (it resists winter temperatures until -17 °C or 1° F). Shape: globose crown. The Tamarisk branches are flexible and arched having supported blossoming. Trunk smooth in the first years, colour ruddy reddish-brown. It becomes tortuous. Deciduous foliage. Leaves in small scales disposed in aircraft propeller around the stem, light green colour. From 1 to 4 mm. Flower in July-August. Small flowers in 5 white or pink petals, and 5 stamens, grouped in spike, which gives them a nice aspect. Fruit capsules containing hairy seeds. The Tamarisk has curative properties: the bark and leaves have an astringent, diuretic action, aperitif and diaphoretic. Prune (maintenance): The tamarisk supports well pruning which must be practiced after blossoming. It is necessary to pull down branches severely to keep a form in bowl. 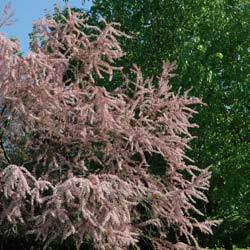 - Tamarix gallica: wild form growing naturally in the South and the West of France, the pink flowers appear from June till August. - Tamarix parviflora: it flourishes in spring on the wood of the previous year, before the advent of the new leaves. - Tamarix tetrandra: it flourishes in spring and differentiates by a spread form and bigger clusters. - Tamarix ramosissima: pink flowers, and ' Rubra ' with red flowers. - Tamarix ramosissima, Tamarix pentandra, Tamarix odessana: they decorate with flowers in summer on the wood of the year.